Tentworld: 35 Tips to keep ice longer in your esky, icebox, cooler or chilly bin when camping. 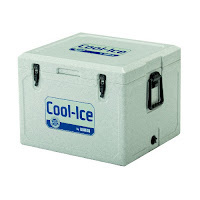 35 Tips to keep ice longer in your esky, icebox, cooler or chilly bin when camping. On the 29/12/2015 a member of the Facebook group: Around the Campfire asked this question. 'Hi, Wanting to know the best way to keep ice in the esky for a longer period of time. Many thanks'. The Waeco Cool-Ice WCI-55 Icebox is one of the most popular sizes at Tentworld. ** Note: Many Australians refer to all iceboxes, chilly bins and coolers as Eskys. Esky is a brand of cooler, and generally they do not have much, if any insulation inside them. They are more suited to parties than for camping trips. A good icebox will last twice as long as an esky. From experience: freeze ice cream containers full of water to make block ice. You can also bust up a some block ice to go on top. Sprinkle with a little salt. Also, make sure everything you put in the esky is cold before hand. Not warm. Lasts much longer. Put a handful of salt in the blocks. Stay colder and take longer to melt. The day before, put everything thats going in the esky in the fridge or freezer, also put a couple of spare blocks of ice in the esky. Then leave loading the esky up till the last minute. The esky is always the last thing to go in my car. Sprinkle salt over the ice or try and get hold of some dry ice. Freeze 2 litre milk bottles with water and stand them amongst your food They take a lot longer to melt than ice cubes - if you dont put salt in as people are suggesting you can use it for drinking water. You can always buy a bag of ice somewhere and top it up every couple of days. Bottles of ice should last 3 days if its kept out of the sun and in a cool spot. I found that using old wine cask bladders works well. They seem to insulate well and don't melt fast. Then you have nice cold water to drink too...as long as you wash the bladder out first! I used to half fill them and freeze them flat so they sat neatly at the bottom or up the sides of the esky. Freeze some big blocks like they say and then get crushed ice. Freeze water bottles. They pack in neatly and you can drink them after. Mine last approx 2-3 days. Milk bottles with salt also. Dont open it as often. Don't use salt, as having this water in an emergency for drinking can be useful. If you are using crushed ice, I usually buy a couple of days before and freeze them properly at home because half the time they are melting before you put it in the esky. We use empty milk containers with salt and water and freeze. Then put your item in your esky and add ice. We also take a 25litre water container and top it up with a block of ice so we have plenty of drinking water that isn't in our esky. The salt water in the water containers we have had ice in our esky for 5-7days. Block ice lasts much longer than crushed. I hate water all through the esky contents so i prefer ice in a bottle or icecream container etc. I also freeze meat etc before hand and have other contents cold before they go in. We have never used salt but also never had an issue. Certainly get frozen blocks but also a Hessian bag soaked in water is good to put on top of everything in the esky as keeps it cool as well. Chuck the esky away, and get an old fridge rip the motor and guts out of it. And use that.. Eskys are no good.. not insulated like fridges.. the ice in my fridge esky is good for 4 to 5 days... just do it you wont look back...! If you're using block ice open the bung enough so that any melted ice/water drips out . Theres no point trying to keep melted water cold unless your going to drink it. Another bonus is your food wont be swimming! Buy an actual icebox for meat etc and open twice a day, mine lasts 4 days. We use to freeze the kids popper drinks and line the bottom and sides of the esky and put everything in the middle then put more frozen poppers on top. ..now we have iceboxes. ..best investment ever.. Put the wet towel on top of the esky and keep wet. Air flowing over the wet towel reduces the actual temp. In the old days food was hung in a canvas device, and kept wet for just this reason. Coolgardie safe was the name. I just run an Engel 12v fridge now so no more soggy snags!. I still take an esky occasionally. Just for beer....only beer... nothing else but beer....mmmmm beer! If you can get a hold of some foam boxes from Butcher or fish shops use these to cover your esky. Especially the lid, this will help. I place block ice across the whole bottom of the esky then place a wire mesh shelf across the top. I then put my food etc on this, and then cover in ice again. I usually use 2 litre ice cream containers for holding the ice. We freeze up old 2ltr Tomato sauce and cordial bottles and line the ice box walls and bottom with it then a towel on the bottom stock stuff and pour bag ice over it. We also take an esky for just drinks, one for food and have the Engel on freeze for our meat. Clip seal sandwich bags, freeze them one week before u go away, mine last up to 6 days, when you buy bag ice dont open it just put the bag in it will last a lot longer. I hope you enjoyed these tips from the Around the Campfire community group.